What is Required for Our Economic Independence? I thank Allah for the Honorable Elijah Muhammad whom I see as “The Eternal Leader of The Nation of Islam,” Meaning that what God has given to him for us now, in the past, and what will come down in the future: We will be feeding on it and growing from it for a long, long time. I’m going to acquaint you as best I can with the Greatness of the Honorable Elijah Muhammad, and why we are suffering today because we rejected him. We didn’t pay adequate attention to him; as a result, today, we are suffering great loss. Hopefully there’s time for us to reverse the loss. The headline of the October 18, 2011 (Vol. 31, No. 2) edition of The Final Call newspaper reads, “We Are At War!” Think about that: If you don’t see that we are “at war,” then you must be raised in consciousness so that you can participate in The War, because The War is for Our Survival! As a people, we have to survive. And if we are ignorant in a Time like this, then our ignorance will be the means of our destruction. We are at war against forces within ourselves, and forces outside of ourselves, that keep us relegated to The Condition of poverty and want. To whom shall we look for “jobs” and “justice”? Do you think that our president, as desirous as he may be, can provide enough jobs for the millions of Americans that are unemployed, and our millions too? Does not history teach us that if jobs are needed by Caucasian people, and Hispanic people and Black people and Native Indigenous people, who will get the jobs first? If they are producing the jobs, then they’re going to produce the jobs first for their people. And if you are lucky, one, two, three or four, or maybe even a few more, might come our way. But History is teaching us, because we have been crying out for this for years: “Jobs! We need jobs! We must have jobs!” We agree with you. But you are acting like “children”—little beggars—who are asking somebody else to do something for us that, with Right Guidance and The Will, we could do all of this for ourselves and earn the respect of the entire world! We’re going to have to get up from where we are and go to work in order to survive and in order for us to prepare a future for our children. Well, that sounds very intelligent. If we are not the owners of land, and lots of it, then we will not be able to produce the things that we consume. So we will always be at the mercy of others who produce, and therefore we will be the consumer people rather than a productive people! And that is how people earn “respect”: by being productive. What do you need? What do your brothers and sisters around the world have? What do they need that we can produce? “Observe the operations of the white man. He is successful…” At least he “was” successful. He is not as successful today as he used to be, but that does not mean that we should not observe him and see how he went wrong, because God is going to give us the opportunity to replace him. “Replace him,” because he has ruined his right to the stewardship of land, resources and people! He has abused the land, the air, the water, and the people on the Earth, so God is going to take it from him, and give it to whom He pleases! And whether you want to believe it or not, He intends to give it to you, and then see how you act, because everybody “looks good” when we’re all “down in the barrel” together. But when God raises you, and gives you power and authority over what you did not create, then He’s trying us to see how we act! If God replaces the wicked rule of the wicked husbandmen of the Earth, who have ruled with injustice and evil, and then gives it to us to see how we act, then I ask you the question that I asked Philadelphia: If God reverses this and makes you “the head,” as you have been “the tail,” will you treat others as they have treated you and me? Or will we thank God for trying us with power; and then proving to God that our hearts are purified, and we are worthy to rule? So all this “bitterness” and “hatred” over what we have suffered: Our hearts have to be purified. As the Bible teaches, “I didn’t choose you for righteousness, because you weren’t righteous. I chose you out of the furnace of affliction,” so this Process that we’re engaged in now is a Process that purifies the heart. So when you speak of “bitterness” and “anger” and “hatred,” and come into power, then you’ll do exactly to others as they have done to you, so you are no better than those whom God is replacing! You have to be better! Well, I, too, would like for us to study the operation of the White man. And the White man who is most successful of all of them is the Jewish people. 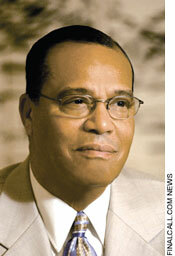 “Farrakhan, are you an anti-Semite?” Well if I were, I wouldn’t be studying them. See, it’s something about “hate,” that when you hate something, you don’t study it enough to find out the value that’s in it! The Jewish people came here as immigrants; they owned push-carts right in downtown New York. Because the established stores did not want a Jew with a push-cart in front of their store, sooner or later the Jews united their dollars, and now most of the stores belong to them. They used to go to Miami, and the hotels would reject Jews. Go to Miami now and see who owns it. They didn’t start the movie industry, but they were being portrayed so badly by the Gentiles that started it, they took it over! You want a job in Hollywood? You have to go by them. “Occupy Wall Street”—who’s running Wall Street? Oh, there are a few Gentiles and a few Blacks that are on the Federal Reserve Board, but who are the banking families that own the Federal Reserve? Who are the banking families that have owned Wall Street? Who owns The New York Times? Who owns The Washington Post? Who owns Time magazine, Newsweek magazine, U.S. News and World Report? See, it’s Jews! Business is Warfare: Because somebody is vying for that dollar that you are vying for! So if they can outsmart you, if they can trick you—if they can give you an offer that you “can’t refuse,” then they’ll take your company from you, because you don’t have soldiers! And if you don’t have any soldiers, you will never be successful in business! But we, The Nation of Islam, have soldiers! Elijah Muhammad and The Nation of Islam started growing in The Womb of America, pulling from what America had to make ourselves stronger and stronger; not ready to “separate” yet because you’re not “developed” enough. Ask your wife: No matter how pregnant she is, you can’t be stupid and say, “I wanna see my baby now!” The best you can do is get an ultrasound and watch it in the womb developing. But you have to wait on development: Until when the tiny house (uterus) that holds that new life is outgrown by that new life. So when that new life has outgrown the uterus, which has grown the size of a watermelon, then the baby starts kicking: “I want outta here!” and it starts moving about. The feet are usually down at the opening, but in the last days, the head turns down. Why? What is that in nature? See, your feet can’t lead you out: You’ve got “leaders” that are “feet”! And you are still where you are because you have not recognized your “head”! But when The Head is ready, and turns down into The Right Position, then The Head Forges The Way To Freedom For The Body! So it is with us: We are growing now in this “womb” called America.